Invite up to 12 people to share this exceptionally fun event!! 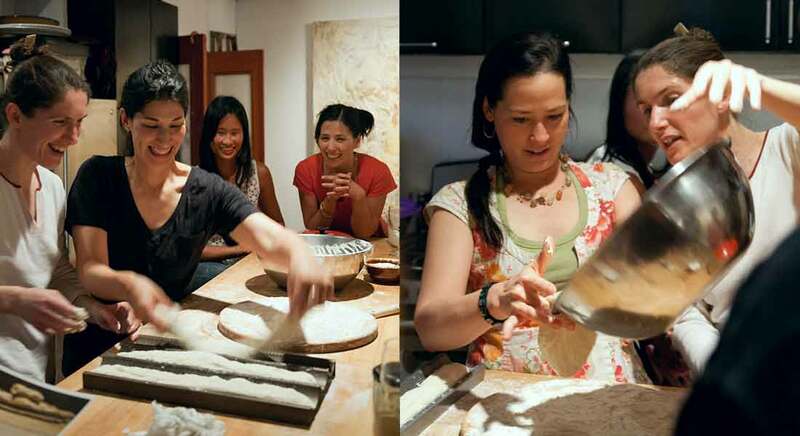 Whether you are looking to plan a different event for your company outing, give your guests a unique and entertaining experience, celebrate your birthday, or throw a bachelorette party, Valentina's baguette baking class is incredibly fun for any group! No previous bread baking knowledge necessary. In this two hours hands-on class you will learn how to bake a delicious baguette in 3 simple steps in a regular home oven. You will be mixing, shaping and baking your own baguette while tasting freshly baked baguettes served with delicious olive oil and wild herbs from the Mediterranean. While your baguette is baking, relax and laugh with your friend, or ask Valentina questions about what you have learned and more tips and tricks for the most exclusive baking experience. At the end of the class you will bring home the printed recipe as well as the baguette you have made to share with your partner, family and friends. Location - Valentina delivers the class at the location of your choice. * Pick a place and you are all set! *To schedule a class outside of the Manhattan borough a minimum of 6 participants may be needed depending on distance. Reserve Now Your Unique Baking Experience! Valentina was born in Florence, Italy. Since she arrived in New York twenty-five years ago, she has been baking her own bread. She has been passionately teaching baguette baking for the past 10 years.